As the Monterey County Water Resources Agency (MCWRA) publishes quarterly reports on the state of groundwater in the Salinas Valley, which invariably show water levels far below the elevations necessary to bring seawater intrusion to a halt, it’s not actually necessary to wait for new seawater intrusion maps to be published to know that seawater intrusion is occurring. I have often been told, by people promoting development projects dependent on water from the threatened aquifers, that until new maps are published there is no way to know for certain whether seawater is advancing – and that, when weighing the pros and cons of their projects, we shouldn’t let gloom and doom speculation about seawater intrusion influence our thinking. The “speculation” being, of course, that water will continue to flow downhill. This is somewhat akin to arguing that until you actually jump off the roof, there is no way to be absolutely certain that you will fall and hit the sidewalk. For those arguing that the law of gravity should be presumed suspended in the Salinas Valley until proven otherwise, the wait for new maps has been satisfyingly long. Until this month, the most recent maps showed the extent of seawater intrusion only up to 2013. The new maps bring us up to 2015 and the water agency is now promising to get the 2017 maps out in 2018. In the meantime, those with skin in the game will no doubt begin arguing that the new maps are already out of date and that we should once again assume that the problem has been solved until newer maps arrive. What the recently released maps show is that seawater intrusion made only small advances in the already deeply intruded 180-foot aquifer between 2013 and 2015, but made very large advances in the deeper 400-foot aquifer (where the heaviest pumping now occurs). Click here to view the new (2015) 180-foot map and here to view the new (2015) 400-foot map. The most eye catching feature on the new maps are the large areas of intrusion appearing, for the first time, ahead of the main intrusion front in the 400-foot aquifer. The source of these salty pools is undoubtedly the overlying 180-foot aquifer, where seawater intrusion already extends further inland. Water can migrate between the aquifers either through natural openings in the layers of clay that separate the aquifers or through abandoned, but not properly decommissioned, wells. The MCWRA report on the new maps points out that the lowest groundwater head elevations got deeper by 10 to 20 feet in the 180-foot aquifer between 2013 and 2015 and by 20 to 30 feet in the 400 foot aquifer. 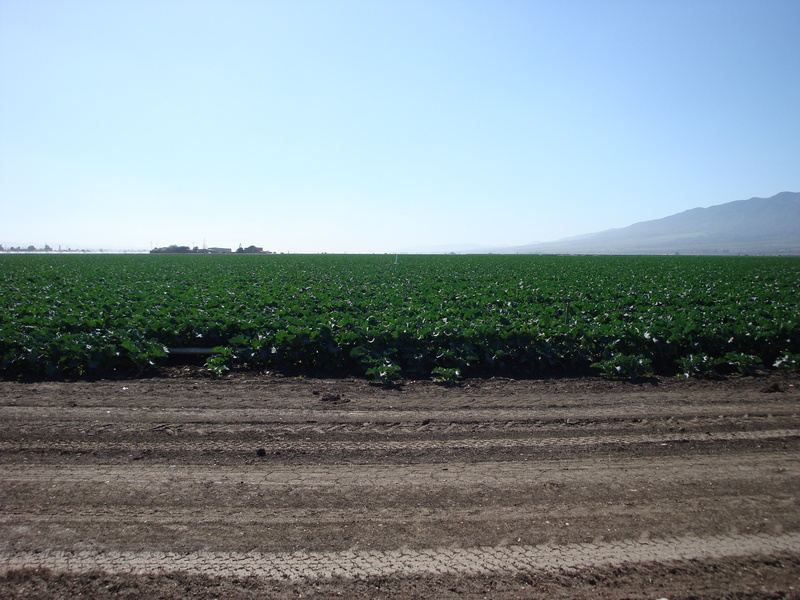 Meanwhile the “zero line,” or the inland location where groundwater head elevations recover to sea level, retreated two miles up valley, in the case of the 180-foot aquifer and one mile, in the case of the 400-foot aquifer. The zero line for both aquifers now lies somewhere to the south of Chualar. So what can we expect to see in 2017 and beyond? Due to the slow rate at which water percolates through the aquifers, the effect of drought on seawater intrusion tends to be delayed. The last time we had a multi-year drought (1984-1991), the rate of seawater intrusion began to accelerate during the drought, but did not peak until about five years after the drought ended. In other words, seawater intrusion was rapidly advancing even while, on the surface, the Salinas Valley suffered historic flooding (1995) and one of the rainiest years in history (1998). Ground water levels in our recent drought fell to lower levels than were seen during the 1984-1991 drought and, in some places, may not yet have bottomed out. The most recent groundwater data, from March 2017, shows water levels in the 180-foot aquifer recovered slightly from their levels in March 1016, but still below the lowest levels seen in earlier droughts. Water levels in the 400-foot aquifer were actually slightly lower than in 2016 (the lowest levels ever seen in March). Water levels also hit new March lows in the East Side Subarea. Only in the more easily recharged aquifers further up Valley was there evidence of significant recovery. The good news is that the rapid advance of seawater intrusion following the 1984 drought may well have been aided by a couple of years of exceptionally heavy pumping. In the 20 years for which records exist (1995-2015), 1996, with 563,438 acre feet pumped and 1997, with 598,139 af pumped, are the record setting years for pumping in the Salinas Basin. Hopefully, less water will be pumped over the next few years and the advance of seawater intrusion will be less rapid than it was in the late 1990’s. So how much water is being pumped? If the outlying years of 1996 and 1997 are excluded, pumping between 1995 and 2015 has ranged from a low of 441,048 (1998), to a high of 527,171 (2008). Unfortunately, conservation measures, better farming practices, etc. do not appear to have created a downward trend. 524,487 af were pumped in 2014 and 514,714 in 2015, both toward the upper end of the range. Even if we look at only the pumping in the aquifers closest to the ocean, and with the most direct impact on seawater intrusion, no downward trend is apparent. With groundwater still at record lows in many places and pumping near the upper end of the normal range, I think it’s safe to say that not only the 2017 seawater intrusion maps, but also the 2019 seawater intrusion maps (whenever they’re released) are going to show seawater intrusion continuing to advance. Unless, of course, water ceases to run downhill. This entry was posted on Monday, July 31st, 2017 at 10:38 am and is filed under Politics, Water. You can follow any responses to this entry through the RSS 2.0 feed. You can leave a response, or trackback from your own site. The county intrusion maps are based on well data. There are new images that are more comprehensive and more optimistic being produced through technology called aerial electromagnetic imaging, aem. Look for images soon, MCWD hosted Stanford scientists yesterday. I very much look forward to seeing Marina Coast’s maps and hearing their reasons for optimism. But regardless of how you define the sea water intrusion front or where you place its current location, as long as groundwater head elevations remain deeply depressed (currently over 130 feet below sea level at the lowest point), I am not optimistic that sea water will stop flowing inland. We hope that you were able to attend last night’s presentation in Marina by Stanford University regarding the results of the recent aero-electromagnetic survey of the portion of the Salinas Valley Groundwater Basin between Marina and Castroville. Stanford has produced three dimensional maps of the salinity/purity of the water in this part of the basin down as deep as 900 feet in some areas. The visualizations that Stanford has produced are far more thorough, nuanced and much more complex than the pictures produced from the recent modeling effort of the Monterey County Water Resources Agency. The County modeling effort is based on traditional hydro-logical modeling methods that get their input data from the existing wells in the basin. Those wells are scattered wherever the farmers needed them and at whatever depths they could afford to drill. The Stanford data on the other hand is the equivalent of having a square grid of tens of thousands of individual wells set about 200 feet apart at all depths throughout the area that Stanford surveyed. The Stanford results give cause for both optimism AND pessimism, depending on where you look in the groundwater basin. The worst news is that there is seawater intrusion anywhere at all in the basin. Such conditions likely did not exist 100 years ago and we would certainly like to see effective efforts under the Sustainable Groundwater Management Act to restore those old conditions. On the optimistic side, the Stanford results show that there are some favorable conditions near Marina at certain elevations in the groundwater basin that are holding local seawater intrusion at bay, despite the recent drought. Certainly Marina Coast would like to see such protective conditions continue and even expand. Unfortunately, there is also evidence that a series of slant wells on the CEMEX property would negatively affect the 180 foot layer of the basin in that area and destroy the existing protective conditions.